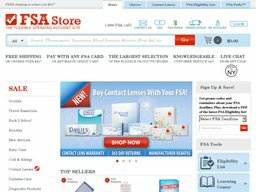 The FSA Store which is found at FSAStore.com, is a leading online retailer accepting flexible spending account payments. This allows customers to purchase any certified FSA products using their FSA account. FSA-eligible products are government certified products and usually fall under medical and health necessities. An FSA account allows citizens to save money for such products in tax free accounts. The FSA Store was one of the first retailers to stock a wide variety of FSA-eligible products so account holders could have a one-stop online store to do all of their FSA related buying. The privately held company is based in New York City, United States. Your savings made at the website can be taking even further with special FSA Store coupons. We keep an updated list of these here at Coupofy, including many great offers and deals. Simply browse one you want to use and you can click through to the store. The FSA Store stocks the largest variety of FSA eligible products online covering children's School items, Baby Care, First Aid & Home Medical, Pain Management, Travel products, Cold & Allergy remedies, Diabetes care, Condoms & Pregnancy Tests, Vitamins & Health Supplements, Quit Smoking Aids, Skin Care, Oral Hygiene, Foot Health, Eye & Ear health, Athletic Supports, Digestive Support, Sun Care, and much more. You can browse via these categories or use the search bar. The store also supplies prescription contact lenses and glasses, so long as you provide a valid prescription with your order. In order to purchase items from The FSA Store you must be registered and you are required to use your FSA Credit Card or account. During the checkout process you will see a promotional box before payment, where you can enter an FSA Store coupon code. Those who would like to purchase one or more products using the services provided by this site should be aware of the fact that they offer free shipping for all orders of $50 and above. Sometimes you can even get completely free shipping with an appropriate FSA Store coupon code. In the case that the order value is of less than the threshold, then a flat shipping fee of $5.99 will be charged. The shipping fee is also FSA eligible, so you can get it paid with the help of your FSA card. The store's return policy states that items can be returned within 30 days of the original purchase date for a full or partial refund depending on the state of the item and whether it still is in its original packaging. The shop may also deduct return shipping costs, but this depends on your personal circumstance. Keep in mind that there is also a restocking fee of 10%. Further claims can be made towards the customer support team of the store, which will get back to you as soon as possible. Of course using any FSA Store coupon will mean you'll only be refunded the actual amount charged, rather than the regular sale value.